Our family has a 200-year tradition of extending country hospitality. From cattlemen traveling the Susquehanna Trail to today’s over-scheduled urban family, warm country hospitality will always be found at Hull-O Farms. We are real people and we put a lot of work into making your farm vacation into a unique and memorable one. Occasionally, some guests take the opportunity to share some of the highlights of their family farm vacation with us. Please take a minute to read what kind of an impact a family farm vacation has had on some people. Amazing for Kids and Adults Too – Whatever the Weather! 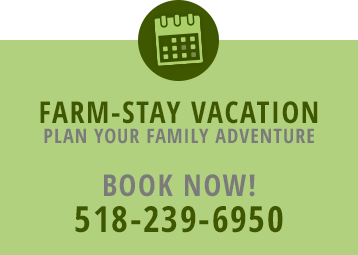 Hull-O Farms for Magical Family Getaway. “My kids Brendan & Olivia will remember this experience for the rest of their lives. We definitely will be back again, hopefully in the fall which is probably the most beautiful time of the year. Thanks for everything.” – Bobbie, Jackie, Brendan, & Olivia N.
“It is amazing that even for our 6th visit the enjoyment is as high as the 1st. Every year things are a little different and the people we meet are different but it all adds to the experience. I know I will be sad when the kids aren’t interested anymore, but for now we’ll see you next year!” – Nancy, Reg, Kyle & Kelsey C.
“Thanks so much for giving us a chance to share a little slice of heaven! You truly made us feel like part of the family. We will have such wonderful memories of our time spent here and look forward to coming back again. We learned a lot about farming and would love to learn more. Until next time.” – Katie, Jon, Patrick, & Jennifer M.
…we got a real education! We got a better appreciation of farming and how important the farmers are. Let’s hope things change for the better for farmers everywhere! Thanks for your good cooking, your friendliness, and your hospitality. We loved it. Expect to see you next year.” – Pat, Jill, & Sara T.
“We really had a wonderful time! The kids had a ball feeding the animals, collecting eggs, etc. Kayla’s favorite thing was playing with the kitty cats. Katrina really enjoyed milking the cows. We really would like to come back next year or maybe sooner. Alvin & I enjoyed talking with you both and your family. We learned a little about your family, the history of the farm and farming in general. It was a very memorable vacation.”– Alvin, Kris, Kayla, & Katrina K.
For several years I have been coming back. “There is something magical about this farm that makes me so attached to this farm. Thank you Farmer Frank for teaching me many new things about farming. Thank you Jared for making me have fun in a weird way. Thank you Jordan for letting me clean your motorcycle. Thank you Travis for being so funny. Thank you Nishi for teaching me French. Thank you Katie for being so sweet to me, you’re a great person. I love this farm so much and I couldn’t ask for anything else.” – Jennifer G.
Check out our TripAdvisor page and our Facebook page for more reviews from our happy guests!